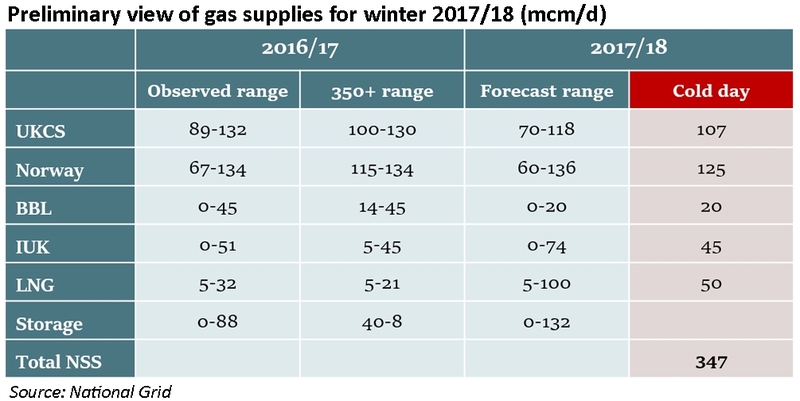 As the UK shivers under attack from the “Beast from the East” – this morning National Grid issued a Gas Deficit Warning, indicating that the gas system was almost 48 million cubic metres (“mcm”) short relative to forecast demand. At 05:00, National Grid was expecting demand to reach 395 mcm for the day, with around 14% of this not being covered based on nominations at the time. At 11:46, the forecast stood at 403.5mcm for the day, with physical supplies at 375.6 mcm. A number of factors is contributing to the shortage, in addition to the extreme (for the UK) weather conditions. The closure of Rough, the UK’s largest long-term gas storage facility is a major contributing factor, removing a potential 45 mcm of daily supply, and leading to the lowest levels of gas stocks for the time of year since records began in 2006. The UK currently has around 0.7 bcm of gas stocks out of a total capacity of 1.3 bcm. As those stores decline, the rate at which gas can be withdrawn is reduced, because of changes in pressure. 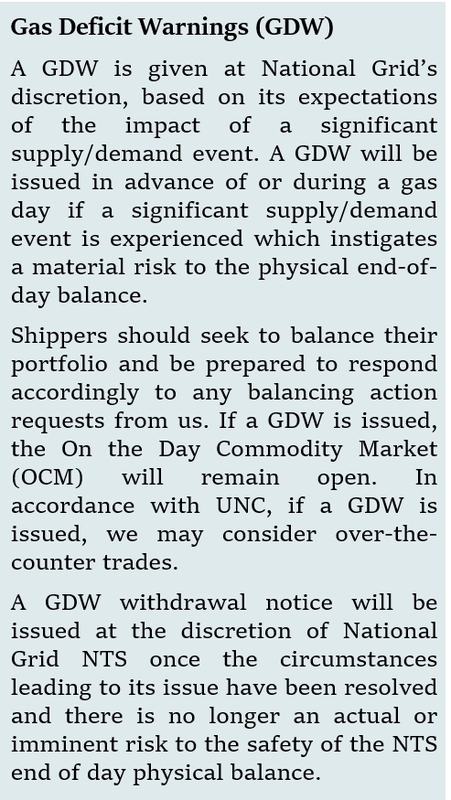 According to Simon Wood, a gas analyst at S&P Global Platts Analytics, at current withdrawal rates, these supplies would last until the end of the weekend before being drawn down. He added that that ensuring there is enough gas in the next few days would be “touch and go”. An unplanned outage at the South Hook LNG terminal has reduced flows into the NTS by 60 mcm/day, and there is an outage at SEGAL pipeline which has cut flows into the St Fergus terminal by 18 mcm/day. This is in addition to an ongoing outage at the Kollsnes gas processing plant which has led to a curtailment of 16 mcm/day. Chemical company Ineos told the BBC it is likely to cut gas usage at its Runcorn plant by 20% in response to the National Grid’s request. National Grid also said it was scaling back off-peak exit capacity within all system exit zones for Thursday’s gas day effective time 1300 GMT. As a result, within-day prices at the NBP reached 12-year highs of 200 p/th yesterday and 300p/th today, with day-ahead gas trading at 116p/th on Wednesday. According to Platts, the UK is struggling to attract supplies from Europe as the cold weather is also affecting the Continent, where gas stocks are at the lowest levels since 2003, so the country is having to rely “purely on indigenous flexibility”. 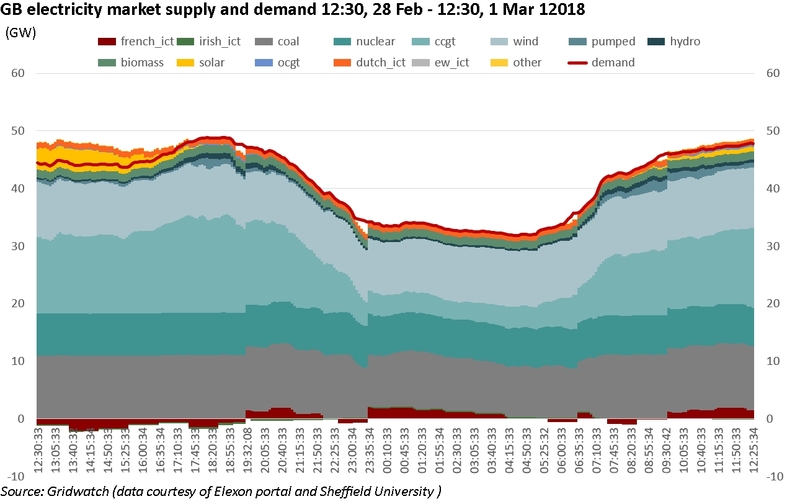 Coal fired generation is stepping in to the breach and is currently running at maximum capacity, meeting almost 25% of UK demand. Gas is still the largest generation source at 28%, followed by wind (22%) and nuclear (14%). In its 2017/18 winter outlook, National Grid said that its preliminary analysis indicated there would be a wide range of potential supply sources to meet demand. Clearly, as noted above, a combination of factors has left the system short today, leading to the gas deficit warning, and the possibility that some users may have to reduce consumption. Unlike in the electricity market, where demand side response is a normal part of the balancing toolkit, it is unusual for gas demand to be reduced to balance the system. The gas system in general is less sensitive to changes in supply and demand than the electricity system due to the inherent storage capacity of the network itself, where at all times there is gas in the pipes, and the amount of this “line-pack” gas can be varied within certain pressure tolerances. However, beyond a certain point, the pressure becomes too low to transport gas to all parts of the system, so larger users declining to withdraw gas helps to maintain pressure and ensure availability for domestic customers and other priority consumers such as hospitals and schools. “Behind today’s gas deficit warning is a ‘perfect storm’ of unrelated short-term issues – freezing conditions, diminished Dutch gas production due to earthquake concerns, weather-related issues curbing imports from Europe, and a global LNG (liquified natural gas) market in which supplies are being pulled to Asia by higher prices. But underlying it is another set of issues that speak to a failure by successive Governments to map out a secure gas future in the way that they have done so successfully for electricity. The reality is that successive Governments have assessed that the cost of new gas storage is not justified by the economic benefits that would result. 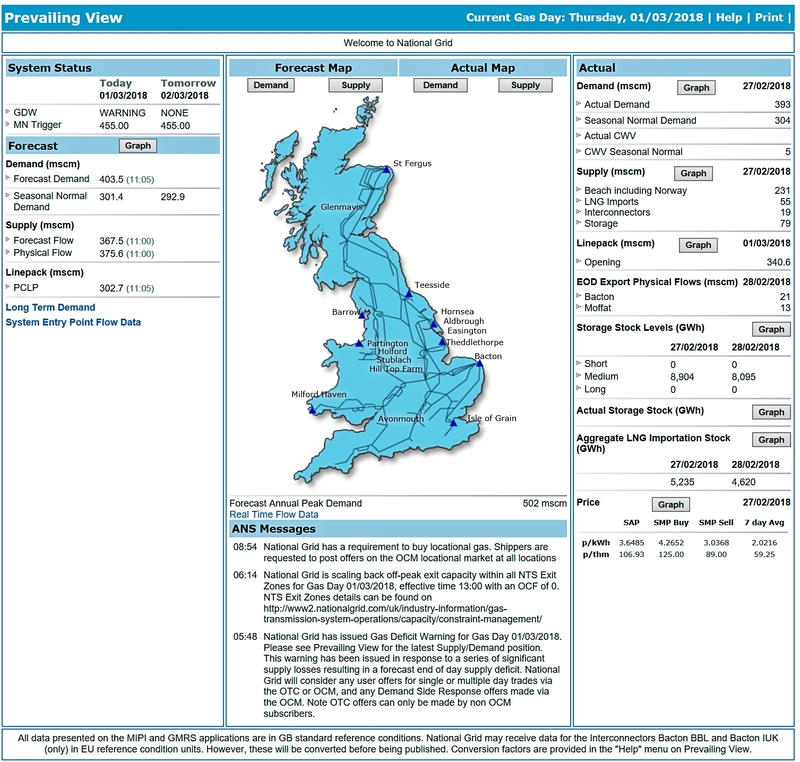 In this case, the cold weather is expected to last a couple of weeks, so the question is whether the economic cost of two or three weeks of supply tightness, with the associated price spikes and potential curtailment of industrial users, is high enough to justify the multi-billion pound cost of new seasonal storage facilities. The last time a similar situation occurred was in 2011, so it is far from clear that the costs would be justified. However, if gas shortages extend to domestic consumers then that would be a major security of supply issue, and the Government may need to think again. The next few days have been described above as being “touch and go” – time will tell.